I got into JC a little over a year ago. He's pretty much an iTunes regular while I'm working. His lyrics are silly, surreal, and sometimes a little bittersweet. Some of my faves include Redshirt, Shop Vac, Still Alive and A Talk with George. AT LAST 3/1: I could use another week or two of testing and trying new things/schemes. Overall, I'm fairly satisfied with where this landed, but even now I'm still pursuing my other hand drawn experiment to see what happens. Fun, but tough - making gig posters is so much harder than I imagined. On the upside of everything, I got to meet so many amazing designers and illustrators here. It was awesome getting to see the variety of styles from everywhere. You guys are all crazy talented! UPDATE 2/27: Buildin' dem vectors. UPDATE 2/22: Final comp in Photoshop before moving into Illustrator. Quick overlay to help me see how things are broken up while I'm pen toolin' tomorrow. Still undecided on a color palette. EXPLORATORY UPDATE 2/21: I started cleaning things up for vector and ended up spending the night experimenting with a more hand-drawn style during the Office hours Livestream. I can see why Kevin Tong or Rich Kelly have so much fun doing it … super time consuming though. I'll have to come back to this style sometime and attempt it more fully. UPDATE 2/20: Took the squid out, but worked his sad tentacles back in. Since he's a giant, self-loathing squid, I placed the pills from the song "I Feel Fantastic" into his tentacle. I believe this gives me some clarity between JoCo and his demented mind. Moving into the build process and color experiments. Thanks so much for the feedback everyone! UPDATE 2/19: Did a small test tonight to round out shapes and try out some rendering methods. I am now pretty sure the squid's tentacles may interfere too much with the focus of the poster. What do you guys think? I know color will solve some of that, and line weight. I may tweak their placement and then start building this, keeping a close eye on their surly curves. Illustrator is being dumbsauce and refuses to let me make a brush with any pressure sensitivity. Or a scatter brush. Which worries me. The internet yields no comfort. My beard itches a little. I got jazzy with the squid and got too far ahead of myself. IS IT BEDTIME!? SKETCH UPDATE 2/17: I refined the sketch further. There are still some tangents and scale issues in some spots that I will fix when I get into Illustrator. I spoke with Steve Treadwell, one of the Oklahoma students, last night. He thought the portal JoCo was standing should be the portal into his imagination or some other world where the ideas come from, which I thought was a good suggestion. I might add a couple more references after fixing some issues, but then again, I might choose some different ones to replace the squid if he proves too troublesome. Still rough - I will likely take another pass at it this week to simplify some of the shapes I've created to make it easier to build without all the fussy detail. What do you a'll think? The type is sketched in for now. RESEARCH UPDATE 2/15: I found this poster by Drew Millward … really dig the style. I might try rendering the first concept two ways to see what works better for JoCo's style and get some feedback from everyone. 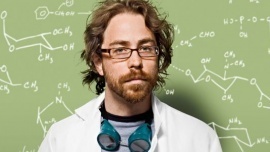 I luckily stumbled upon Jocopedia - the ultimate fan resource for all things Jonathan Coulton. After reading through his discography, I picked a few of his most popular songs that regulary get performed and then looked for stories behind the songs or imagined imagery that could represent those songs. I also plan on doing these in vector. I'm greatly inspired by Tom Whalen and James Gilleard, so we'll see if I can wrangle some of those flat shapes to make this happen. For the above concept, I have JoCo playing to Code Monkey while standing in a portal. Jonathan has a few elements to him that reflect some of the songs. On the next round, I will have a chance to dig in there and find more metaphors. I found out the inspiration for one of his songs "The Future Soon" was imagining the future how a 12 year old reading OMNI magazine would imagine it. I decided it'd make a cool OMNI magazine cover, so I'd do up the title of the poster in the OMNI type style. I think I'll put in a giant squid in the background, its enormous eye serving as the moon. I've included an OMNI cover to show the kind of cool, weird graphics featured. The above concept utilizes several smaller silhouettes from his more popular songs to create JoCo's guitar. Creepy dolls, robot overlords, a depressed giant squid and a shop vac are just a few of the icons that can build this instrument. I'd really like to fill this sucker up with more icons in the instrument, so any Coulton fans, totally tell me if you have an idea! I also adjusted the imagery a little. The more I looked at it, the more cramped the first one felt. I gave the second concept a smidge more breathing room.